Valencia is definitely a walkable city. In fact, walking is so convenient and the city is so compact that every service we’ve needed is within a few steps, or at most a few blocks of our home. We don’t have a car and we rarely use public transportation. We walk everywhere instead. But a walk in the city, no matter how pleasant, isn’t a walk in the countryside. Eventually we began to long for the quiet of a hillside trail far from hustle of the city center. Which was a problem for me. Until one fateful Saturday…. That Saturday morning we bumped into Mat and Kathryn who were out walking their dog Stanley. Our young English friends had just learned that dogs are allowed on the local commuter trains. 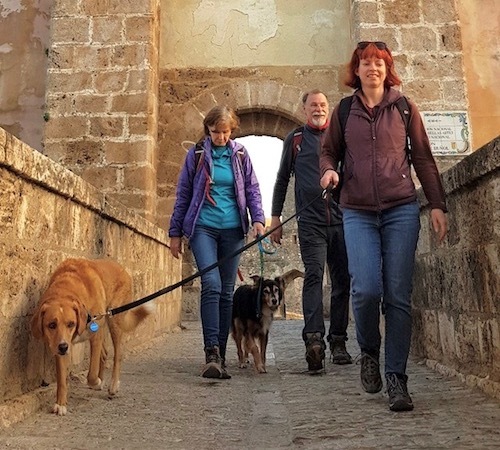 I think it was Mat who proposed a joint “expedition” and within 10 days, four people and two dogs embarked upon la práctica del senderismo (the practice of hiking) in the countryside around Valencia. Since then we have, in various configurations of participants, sallied forth on a regular basis. 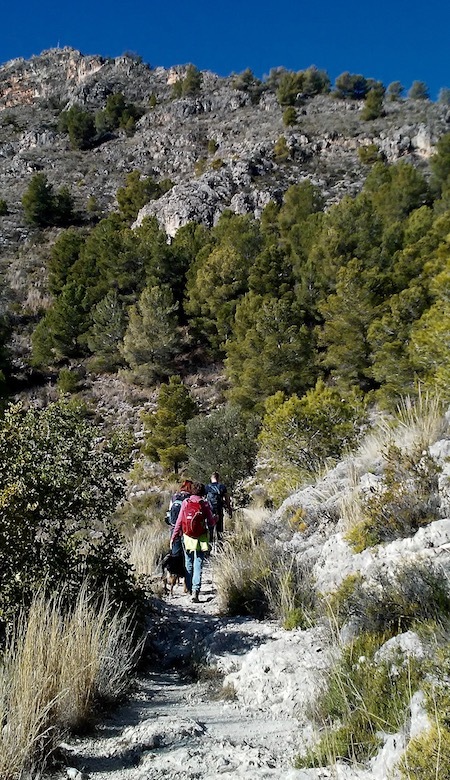 Our first step is to identify a suitable hike that starts and finishes close to a Renfe train station. We’ve been using three tools for this. Wikiloc.com is a community supported website where you can find (and share) free GPS-tagged outdoor trail maps for hiking, cycling, and other outdoor activities. There are wikiloc apps for iPhone and Android so you can track your progress on a trail. The level of detail that people include when they document a trail varies widely. Some have dozens of photos and an extensive narrative, others are pretty much limited to the GPS data file and little more. Waypoints and an elevation profile are part of the Wikiloc route descriptions. Technical difficulty: Routes are rated as Easy, Moderate or Difficult. Some routes rated “Difficult” require more scrambling over steep rocky sections than we are comfortable with. Time and Distance: We like to choses routes between about 12-20 km that can be completed in 3-5 hours. This usually leaves us time to explore the town and stop for refreshments. During short winter days we can’t manage more than 20 km with a comfortable margin of safety. We definitely don’t want to be out on the trail after dark. Easy to Follow: We’ve learned that many trails have segments that are very hard to find or follow. We spend a bit of time trying to puzzle out “Easy to Follow” routes. Can’t imagine how far afield we might end up on difficult to follow routes. Scenery/Photos: We chose trails that others have posted appealing photos from. Who wouldn’t? Of course, finding the ideal trail in the Valencia Community isn’t going to help if we can’t get to the trailhead with our dogs (and no car). That’s where Cercanías Valencia comes into the picture. No one seems to mind if we slip Lizzie’s muzzle off during the train ride. Cercanías Valencia is the commuter rail service that serves the Valencia metropolitan area. The network includes six lines and serves 66 stations. It’s quite extensive. 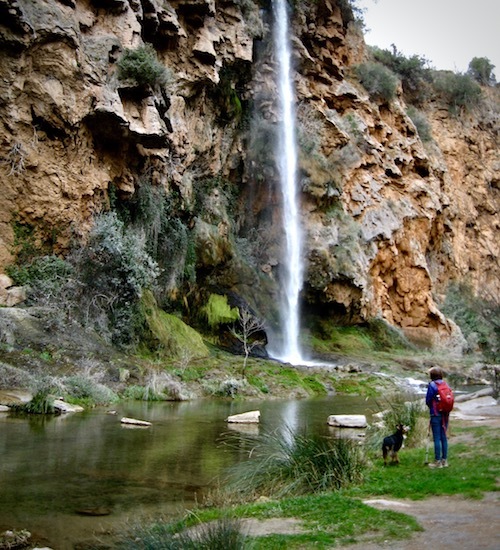 For example, our day hikes from the rail stations at Sergobe-Arrabel and Xativa were each about 60 km from Valencia. 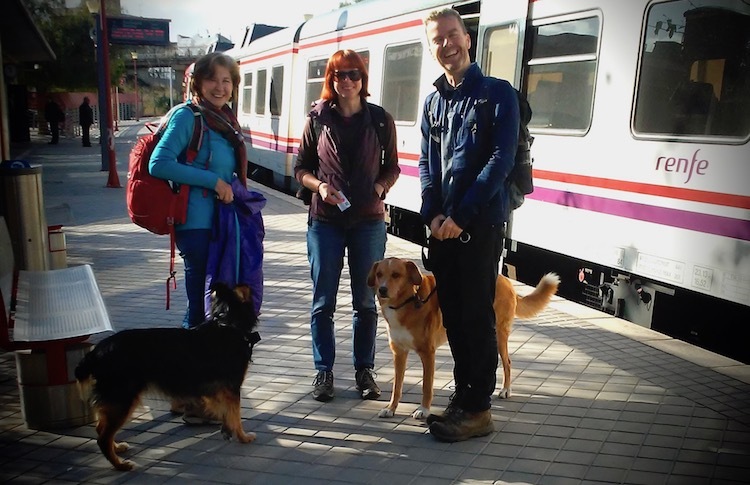 You can take your four footed friends on Cercanías Valencia trains. Unlike long and medium distance trains there are no weight limits. And pets do not require a separate ticket. But you will need to have them on a lead and dog muzzles are required. It didn’t take long for us to figure out that if we muzzle the dogs during boarding and disembarking no one seems to mind if we slip the muzzels off during the train ride. Stanley and Lizzie are both gentle souls and are obviously non-threatening. Your dog may be more energetic. We think going by train is both economical and convenient. Ticket prices range from €1.80 for Zone 1 up to €5.80 for trips to Zone 6. For €6.00 per year, Susan and I purchased Tarjetas Doradas (golden tickets) available to those over 60 years of age. The Tarjeta Dorada entitles us to a discount (25-40 percent depending on the time and day) on single or round trip tickets. Cercanias trains usually run frequently, often hourly. Always double-check that the return train schedules fit the expected duration of your hike. You don’t want to learn that the last train of the day left 10 minutes before you made your way back to the station. At least we don’t. Luckily, that usually is not a problem. Just a few words about trail safety. If you are new to hiking in Spain, you might like to know about some of the risks you might face out there on the trail. (They aren’t too scary, you just need to be aware). In winter or early spring you may want to avoid hiking in the pine woods of southern Europe. That’s when the larvae (caterpillars) of the pine processionary moth (Thaumetopoea pityocampa) are actively foraging. These caterpillars are quite toxic. Contact with the hairs of the caterpillar can cause severe rash and eye irritation in humans. Dogs and cats who have sniffed or bitten at the caterpillars will suffer extreme toxic shock. Many are reported to have died as a consequence. On the Trail Near Buñol. Susan and I depend on our hiking poles on the occasionally rough and steep trails around Valencia. We choose to leave Lizzie at home if there’s any possibility of encountering these toxic pests. If you are accustomed to walking well-maintained trails, you may find some of the trails of Valencia Community a bit rough and steep. Susan and I depended on our trekking poles as we slid and skittered down some of the surprisingly steep descents we’ve encountered. Good footwear is also a must for us. There are plenty of sections where loose rubble could easily lead to a turned ankle. Rough trails are also why we make double sure to carry a basic first aid kit. Just in case one of us takes a tumble. We’ve only been out in the winter months so far so dehydration hasn’t been a risk factor. 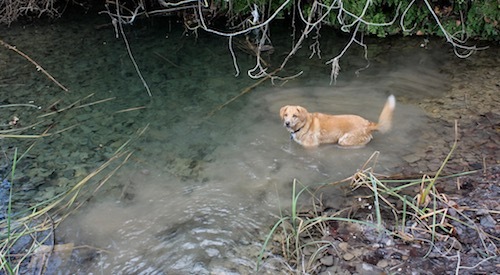 But if you go out on a hike in the heat of summer, bring plenty of water for you and your dog. I’ve always been happy with a paper map, but after a handful of trips, Susan and I are ready to buy a handheld GPS unit. We’ve temporarily lost the trail so many times on our outings thus far that it seems like a worthwhile investment. The mobile phone wikiloc app works for wayfinding but phone batteries aren’t up to a full day of navigation. Besides we’ll be able to use the handheld GPS unit on our cycle tours too. Here are four routes that we enjoyed in the winter of 2017-2018. They are circuit routes and are listed by the RENFE Train Station closest to the trialhead. If you haven’t visited Xátiva, it should be high on your daytrip list, even if you aren’t up for a walk. Susan and I spent most of one day getting to know the town and its historic castle. Read Day Trippin’ Destination Xátiva for more on that. Route Highlights: We enjoyed a full day excursion when we did this 20km + route. The trail crosses a variety of agriculture and undeveloped lands and there are some very nice views of Xátiva castle. The climbs are not difficult for anyone accustomed to walking and the trail is well maintained. We had a grand time imagining life during the Neolithic at an archeological site we encountered. Everything was going great until we came to the bridge that was no more. WARNING: A footbridge across Rio Albaida about 3/4 of the way into the hike is washed out and we saw no evidence that it will be replaced. We ended up backtracking a couple miles, adding the distance to an already challengingly long walk. You’ll probably need a full day for this hike. 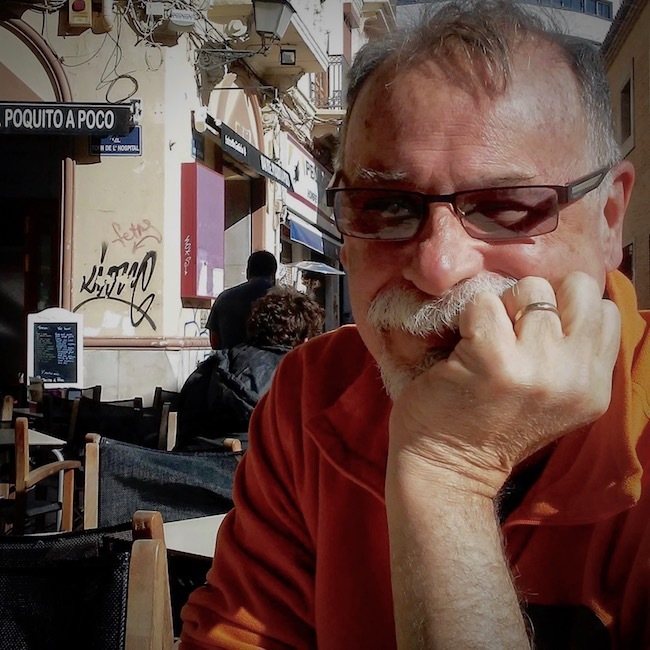 We left Valencia from Estación del Norte before sunup and didn’t get back to Valencia until well after dark — of course, it was December 23, nearly the shortest day of the year. Route Highlights: Most people don’t visit Buñol except during the famous tomato battle they hold every year. It’s a pity because the landscape around the village is beautiful. We experienced a little bit of everything on this hike. We started by walking through the village to get to the trailhead. Progressed through a dryland agriculture zone along country lanes and eventually climbed out of the valley along steep and scrambly paths where we took in regional vistas and found a delightful little stream where we enjoyed our lunch. Cascades and cool pools, dry terraces, and a castle at the end of the walk made for a pleasant outing. WARNING: We saw many processionary caterpillar nests in the pine trees along this route. The caterpillars hadn’t yet emerged so we didn’t worry for our dogs, but I think that I would save this hike for summer or autumn just to play it safe. Because this was our first ever outing in the Spanish countryside, we spent a fair amount of time puzzling out how paint colors and patterns are used to mark trails. We should have done our homework. It was a good lesson for us. Route Highlights: Sagunto (or Sagunt in Valenciano) is another town in the Valencia Community that is worth a visit, aside from the walk. In fact Susan and I weren’t planning on the walk we made the day we visited with Lizzie. We learned about the route that circumnavigates the hilltop castle that overlooks the town when we visited the Tourist Information center in the town hall plaza. The route begins near the castle gate with a deceptively smooth graveled, shady amble. A few hundred meters into the walk you’ll cross a castle wall and the way changes to a well-trod country path. All is well until you get around to the south side of the castle where the trail requires several episodes of scrambling over steep rocks or loose scree. Surprising considering we were told it was an easy walk. There are wonderful views of the countryside, interesting cultural items like an old Roman cistern (Don’t fall into it. ), and several hermitages along the way. We recommend making the effort, but caution you to bring sturdy footwear. 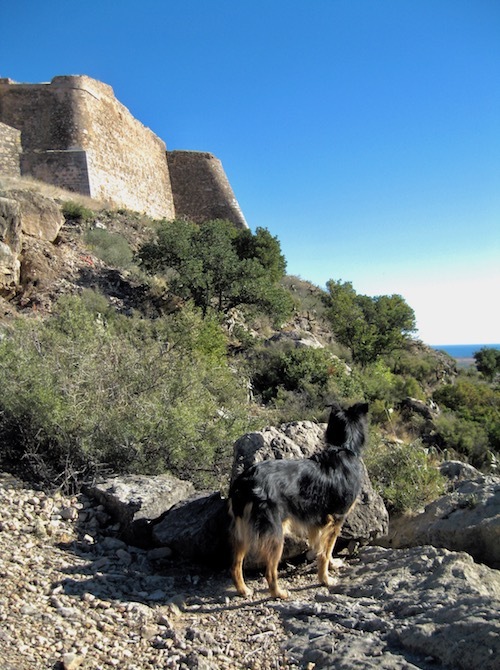 If you decide to visit Sagunto with your dog, be aware that the Roman Theater and Castle do not permit entrance to our four-footed friends. Route Highlights: If you make this hike on a Sunday like we did, you will have to contend with the paucity of trains. We decided on an early departure from Estación del Norte so that we could finish the trail by around 2 pm because there was only one later train at around 6 pm. Nevertheless, the waterfall and the intriguing rock forms that you will find at the turnaround point of this hike are definitely worth the effort. Along the way you will climb to a high ridge that affords remarkable views of the valley of Rio Palancia, Segorbe Castle and broad regional overlook as well. We had trouble keeping to the trail on the return leg and ended up balancing on the edge of an irrigation canal. Rather than make this hike a circuit, it would be easy to walk one way and catch the train at Navajas after visiting the falls at Salto de la novia. Thanks for all the information. I love how you’ve given us the resources to use ourselves and some suggestions. Lizzie looks perfectly content on the train and at Sagunto’s Castle. Many thanks. We think that Lizzie has made a complete adjustment to Spain and to our retirement. She goes out on adventures several times a day. Not all of them are as big as these, but she’s happy if she just gets to walk around town and meet up with a few of her new friends. Looking forward to many more hikes with you guys ???? Many, many (I hope). Thanks for the terrific photos.